For the river of Tripura and Bangladesh, see Gumti River (Tripura). 900 km (559 mi) approx. The Gomti, Gumti or Gomati River (Hindi: गोमती Gomtī) is a tributary of the Ganga River. According to Hindu mythology the river is the daughter of Sage Vashist, and bathing in the waters of the Gomati on Ekadashi (the eleventh day of the Sanatana Dharma-Hindu calendar) can wash away one's sins. According to the major religious work, Srimad Bhagavatam, the Gomati is one of the many transcendental rivers in India. It is the river where sacred Gomti Chakras are found. The Gomti originates from Gomat Taal which formally known as Fulhaar jheel, near Madho Tanda, Pilibhit, India. It extends 900 kilometres (560 mi) through Uttar Pradesh and meets the Ganges River near Saidpur, Kaithi in Varanasi district. After 20 kilometres (12 mi) from its origin, a very small river, the Gaihaaee, meets it. The river is a thin stream until it reaches Mohammadi Kheri (about 100 km from its origin), a tehsil of Lakhimpur Kheri district, where it is joined by some tributaries like Sukheta, Choha and Andhra Choha. From here the river is well defined. Later other tributaries join this river. These are Kathina at Mailani and Sarayan at a village in Sitapur district. Another major tributary is the Sai River, which joins near Jaunpur. At the sangam (confluence) of Gomti and Ganges, the famous Markandey Mahadeo temple is situated. After 240 kilometres (150 mi), the Gomti enters Lucknow, through which it meanders for about 12 kilometres (7 mi). At the entrance point water is lifted from the river for the city's water supply. In the Lucknow area, 25 city drains pour untreated sewage into the Gomti. At the downstream end the Gomti barrage impounds the river converting it into a lake. 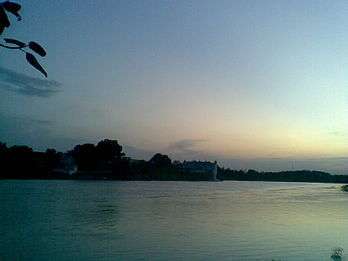 The cities of Lucknow, Lakhimpur Kheri, Sultanpur and Jaunpur are located on the banks of the Gomti and are the most prominent of the 15 towns in its catchment area. The river cuts the Sultanpur District & Jaunpur city into two equal halves and becomes wider in Jaunpur. Gomti river is under "assault" at various points of its journey as it meanders through the 900-kilometre (560 mi) stretch of rich alluvial plains of Uttar Pradesh. From industrial effluents to domestic discharge, the river becomes more of a flowing dumping yard for the 15 smaller and bigger towns, including Lakhimpur Kheri, Sitapur, Lucknow, Sultanpur and Jaunpur, in its catchment area. Industrial waste and effluent from sugar factories and distilleries. Domestic waste water and sewage from habitations. The river collects large amounts of human and industrial pollutants as it flows through the highly populous areas (18 million approximately) of Uttar Pradesh. High pollution levels in the river have negative effects on the ecosystem of the Gomti, threatening its aquatic life. On 25 July 2008, foundation stone for a sewage treatment plant was laid, which would have a capacity of 345 million litres (91,000,000 US gal) of effluents per day. ↑ "Gomati River Expedition 2011". Retrieved 18 January 2013. ↑ "Bhaktivedanta VedaBase: Srimad Bhagavatam 5.19.17-18". 2010-01-04. Retrieved 2010-01-04. ↑ "Magic SEA Underground: Magical Uses Of Gomti Chakra (Cat's Eye Shell)". liewsp1-magicsea.blogspot.in. Retrieved 2015-11-07. ↑ "Aiming for a scrubbed clean look". The Times Of India. 2010-01-28. Retrieved 2010-01-28. ↑ "Foundation laid for country's largest STP to clean Gomti in UP". 2008-07-25. Retrieved 2008-12-21. 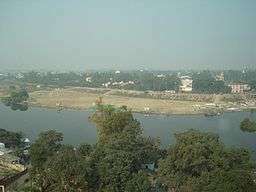 Wikimedia Commons has media related to Gomti River.